The morning of Tech Camp, Nikki, Heather, and I all met in the hotel lobby to walk to the conference center together. 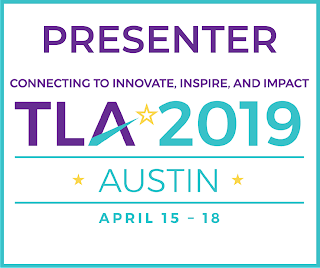 We needed to pick up our registration for TxLA, scope out our presentation rooms, grab food, and of course, not be late to hear Hadi Partovi's opening keynote! 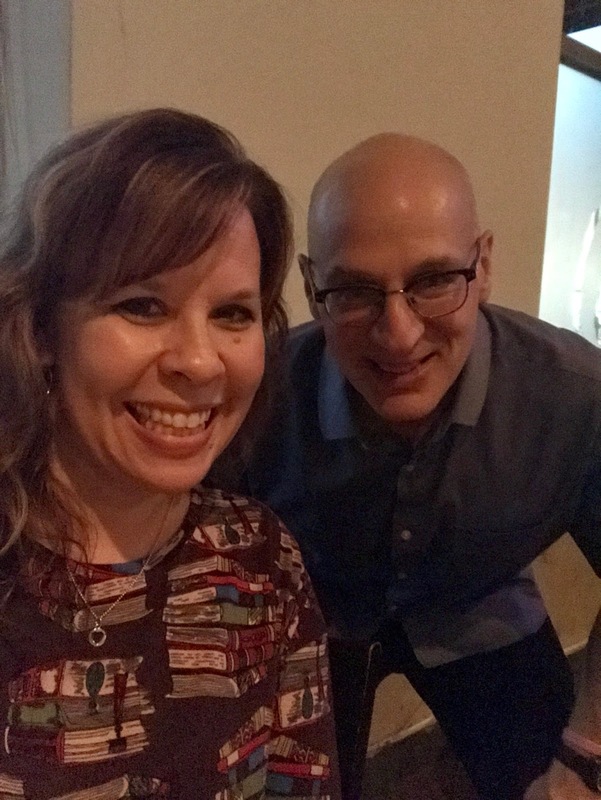 I was tickled to almost immediately bump into my online friend Andrea Keller! We've followed each other and talked on so many social media channels for years, it was a treat to finally hug her neck! The room was packed OUT for the opening of Tech Camp. Hadi Partovi did not disappoint one single bit. As a huge supporter, believer, and teacher of code.org it truly was a dream come true to hear him speak. the main room for Tech Camp keynotes! As soon as Hadi finished speaking, Nikki and I RAN to the stage to ensure we'd be able to meet and get a pic with Hadi. (Sometimes you have to be bold!) We then made a beeline out of there as it was almost time for my first presentation. Imagine my surprise when I got to my room and it was already FILLED! 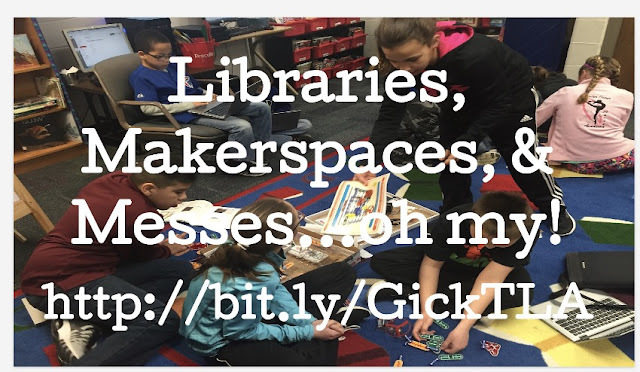 Session 1: Libraries, Makerspaces, & Messes...Oh my! Nikki helped me get setup with my computer and microphone and then shooed me out to quickly take a pre-speaking break. (Seriously, it is amazing to have friends with you when you're presenting who "get" it. Thanks so much Nikki!) My head was filled with what I had planned to do for my presentation and how to make it work with the crowd in the room. And then, a great idea hit me! I was super excited and couldn't wait to get started sharing and presenting. The first part of my allotted time I focused on sharing pics and stories from my former school library with lots of links for participants to visit later. The second part of my time, I wanted everyone to be able to share their own experiences and successes from their school libraries. The smartest person in the room is the room, so to me it was pivotal that everyone not only hear from me, but from each other as well. I wanted to utilize a Wagon Wheel protocol (Shout out to my director Kelly Clifford for teaching me this!) but it wasn't possible with the room setup. So...we headed to the open space outside of the room. What ensued next was a bit chaotic, a bit loud, and.... a whole lot of amazing! School librarians were animatedly sharing with each other, listening to ideas, and learning from each other. Yes, there was a crazy woman standing on a chair in the midst of it all directing the wagon wheel with discussion questions, but somehow...it worked! Check out the video below, kindly filmed by Nikki! Whew! It was a rush of excitement and sharing. I'm so glad it worked out so well! Afterwords, I even found out that Andrea had tweeted her sketch notes from the session. Super cool! After a sweet introduction from Nancy Jo, it was time for me to speak. Yes I was nervous, but the front row was filled with friendly faces. Also, as I began to speak I remembered I was telling stories about my amazing friends, my awesome students and THEIR library -- this was not about me! After my keynote, I took a few minutes to eat MY lunch and then went to Nikki's next session to hear her share about Digital Playgrounds: Who's On Recess Duty. As usual, she transfixed me as I listened to her preach the gospel of social media and the urgent need for educators to not only teach students how to use it for good but also to model and be a part of social media networks. Here's to new (& old!) Texas friends at Tech Camp! Needless to say, I was both invigorated and completely exhausted at the end of Tech Camp. I wanted to go be at the opening of the exhibit hall, but the lure of my hotel room and a nap were too much to resist! It was time for this introvert to rest and recharge! Later that evening, I headed out to the Scholastic Dinner. My friend, Donalyn Miller, assured me it was a small intimate event that I would enjoy. I'm so thankful I went! I had the pleasure of having dinner with both Gordon Korman and Ally Condie as well as several other librarians and publishers. The conversation was stimulating and the food was delicious. Thanks Scholastic! Gordon signed a copy of his new book coming out for Coen!